Hakuba Happo-one is one of the most famous ski resorts in Japan and the fascination of Hakuba Happo-one is the majestic view of the Northern Alps. The majestic view with fresh green leaves in spring and autumn foliage with new snow at the top of mountains in autumn are greatly admired by local people as well as the deep snow in the winter season. There is a pleasant mountain view during the four seasons. To introduce this beautiful and unique scenery, we opened a private open-air onsen (Hot springs) in 2014 and the flower park in 2015 at Kitaone Kogen Highland. 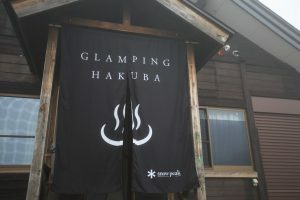 Located at 1,200m high and the area offers some of the most beautiful scenery from Hakuba Happo-one. These days, the popular tourist spot is attracting around 20,000 visitors per year. Now, we have something more to offer. 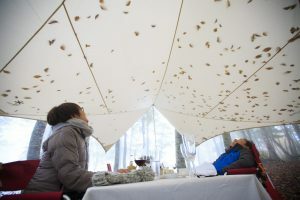 It is ‘precious moments’ such as the sunset and sunrise with nobody around, breakfast in the forest and just relaxing while watching the marvelous mountains. The best way to feel the ‘precious moments’ is to stay overnight at Kitaone Kogen Highland. 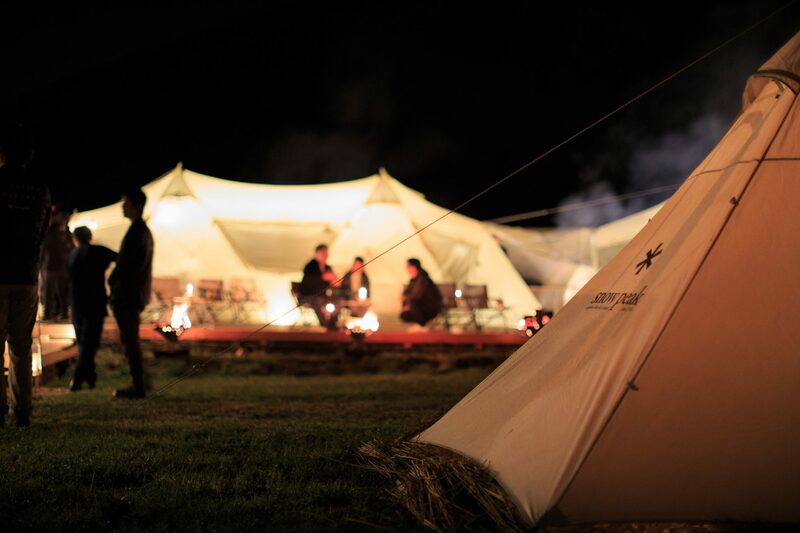 In making the dream become a reality, we partnered with an outdoor company called Snow Peak and plan to open FIELD SUITE HAKUBA as a glamping site in 2018 at Kitaone Kogen Highland. 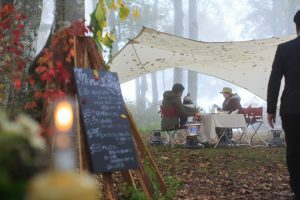 FIELD SUITE HAKUBA offers a relaxing time in the middle of nature. 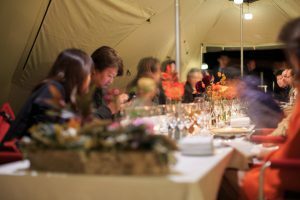 Chef and sommelier will serve meals and drinks. 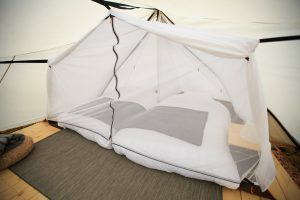 Rooms will be ready with luxurious comfort produced by Snow Peak. Staying overnight in one of the best locations, you can experience our hospitality and high end service in style with stunning panoramic views all around you, take in the natural ambience and enjoy your precious time. We are pleased to announce that we will open only on 12th October 2018 and have a limited 8 couples, 16 guests before the grand opening in winter 2018. 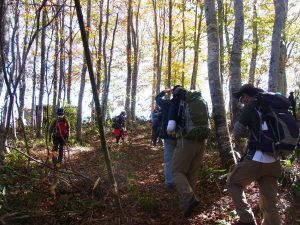 Hakuba will be surrounded by beautiful autumn foliage at the time. We look forward to seeing you at FIELD SUITE HAKUBA at Hakuba Kitaone Kogen Highland. 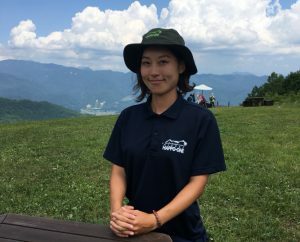 Concierges have been working on the maintenance of the flower park and are discovering Kitaone Kogen Highland every day for guests. 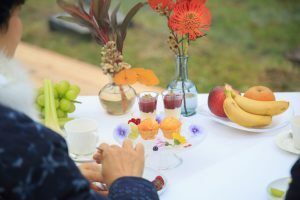 They are happy to support guests with sharing the idea of the forest trail course, to guide the flower park and to advise the spots where guests can relax or have breakfast etc. FIELD SUITE HAKUBA has only 8 rooms in the great nature. 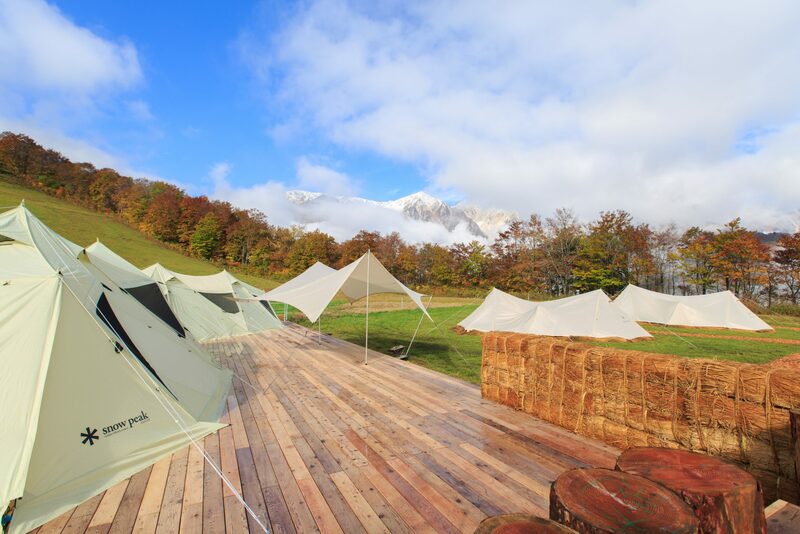 Enjoy staying in the middle of nature with luxury tents produced by Snow Peak. Drinks and a light meal will be ready at Kamoshika Lounge upon arrival. 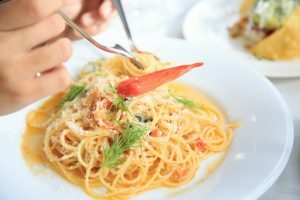 Enjoy the fine dining course menu using plenty of fresh local ingredients. 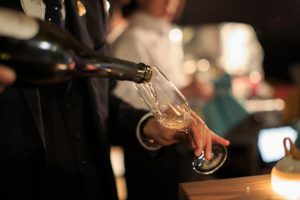 The well experienced and highly knowledgeable sommelier will carefully select beverages to match the exclusive dining experience. 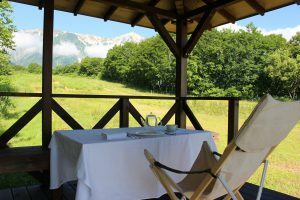 Choose a place to have breakfast in the Nature Flower Park whilst enjoying a wonderful sunrise with the alpenglow reflecting on the mountain peaks. This is a sight only to be captured here at Kitaone Kogen Highland. Served at Kamoshika Lounge before departure. Enjoy walking in the beech forest with several courses, which takes 15 to 60 minutes. 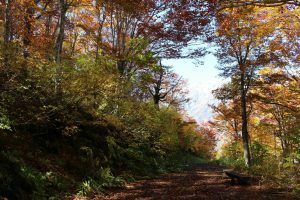 In autumn, you can stroll in the colored beech and see the beautiful three-stage autumn foliage at Hakuba three peaks at any time from early in the morning to the evening. There are about 200 kinds of wild grasses and flowers growing at Kitaone Kogen Highlands and you may see some animals as well. Use flowers in the flower park and concierges will guide and show you how to make flower dyeing. 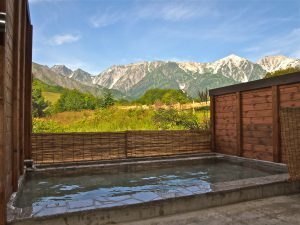 Enjoy an exclusive time in open-air onsen with the beautiful Hakuba three peaks mountain view. Public space for drinks. 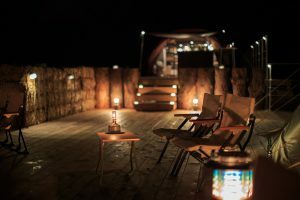 (Drinks are all inclusive) Please have a precious time in an unusual and quiet space in the surroundings of an open bonfire to relax and reminiscence. 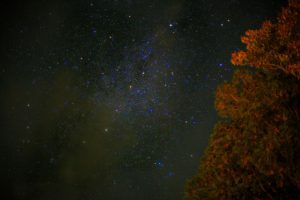 Enjoy a luxurious experience while watching the starry sky and soaking your legs in the natural foot onsen. 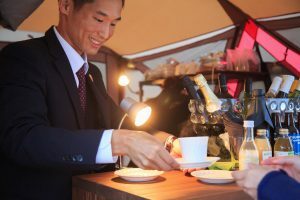 FIELD SUITE HAKUBA will open for a limited time on specified dates, 12th – 13th October 2018 as pre-opening. The grand opening will be in winter 2018. 11:00 Meeting at the ticket gate of Shinkansen (Bullet train) of Nagano Station and transfer by private vehicle. 12:00 Arrive FIELD SUITE HAKUBA by chair lifts and check in. 19:30 Free time: Relax at Kamoshika Lounge/Takibi bar, Ashiyu Galaxy etc. * Breakfast will be served at the place you select. * Lunch will be served after checking out. * Guests who come by own car are able to check out any time. Please meet our staff at the ticket gate of Shinkansen (Bullet train) at Nagano station. Please come to the carpark at Sakka Kitaone Chair Lift. *Please note that a booking can accept over 2 guests. Ticket gate of Shinkansen (Bullet train) of Nagano Station at 11 am. Carpark of Sakka・Kitaone Chair Lift between 12:00 pm and 3:00 pm. 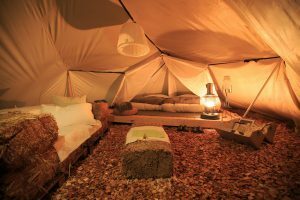 Tent style rooms out of bathrooms. *Onsen will be opened by privately for guests or separated according to gender (male/female). A private vehicle will be provided from Nagano Station. Recommend to bring a warm jacket such as a fleece jacket, a nylon hoodie and a down coat so on due to temperature gap between the daytime and night time.